Runaways is written by Noelle Stevenson and drawn by Sanford Greene. It’s a reboot of the 2005 original series. 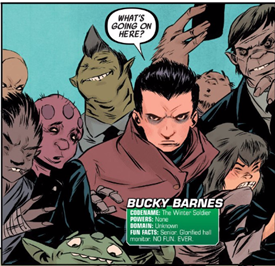 This time around our protagonists are students who attend a school for the elite in Battleworld. When they find out their school is run by a super villain they run away. I’ve been looking forward to this one since I first heard about its release in back in March. So without further ado…. 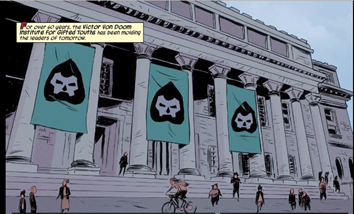 The issue begins with a video advertising the “Victor Von Doom Institute For Gifted Youths”. It’s all about gathering the best and brightest young people from all over Battleworld and training them to be the best they can be so that they can to have a “bright future”. There’s also a focus on obedience which suggests to me that this school is only for the best and brightest who are willing to use their talents to Doom’s advantage. The video is being shown to our main characters as they sit in detention. Most of the characters are younger versions of an already established character in the Marvel universe (or what was the Marvel universe before Secret Wars.) There’s Jubilation Lee (codename Jubilee, X-Men), Megan Gwynn (Pixie, X-Men) and Amadeus Cho to name a few. One of our main characters, Molly Hayes, is from the original Runaways series which I thought was a nice touch. It turns out they all ended up in detention after a fight broke out between Sanna Strand (Frostbite) and Jubilee and somehow all of them got dragged into the fray. Jubilee looks to be the type of character who doesn’t know when to back down; she only manages to get a hold on Sanna thanks to Molly’s super strength. Molly’s that annoying younger character who wants to be like the older kids (she’s eleven, everyone else in in their teens). She’s trying to kiss up to Jubilee because she wants to get into her crew called the Night Witches. I usually dislike young tag-a-long characters because they tend to be the ones who get themselves into trouble. With Molly’s super strength, I’m hoping that won’t be a problem. The fight eventually stops due to the appearance of a teenage Bucky Barnes (codename: “The Winter Soldier”. ), which I thought was a cool surprise. He’s a senior described as being “NO FUN. EVER”. Back to the present: everyone is agitated because they want to be on time for team registration for the final exam. If you pass then you get access to an endless stream of opportunites as a member of the Doom Elite. If you fail (which we are told most of them will) then you get none of that. The protagonists’ futures are literally riding on their final grade, a pressure which most teenagers feel during high school. I like how this comic takes that idea of inaccessible opportunity at a failed grade and makes it literal. That being said, I just can’t get behind the idea of a school wanting its students to be late to an exam, no matter how much trouble they get into. This seems even more unlikely since the final exam essentially determines whether they’ve been wasting their time. The exam is treated more like a privilege than a right. Maybe the punishment is meant to come during the exam: if you’re not on the team you want to be on, you fail the exam and don’t get the opportunities? Amadeus uses his technical knowledge to reprogram the machine that’s watching everyone into releasing them from detention. Hayley unnecessarily uses her super strength to rip the door apart (maybe the whole trouble thing isn’t too far off…) and the troupe races to team registration. When they arrive all the teams are formed and they’re all forced to team up together. Maybe my punishment theory wasn’t so far off after all. We then flip to a scene where Bucky and the headmaster of the school are telling Victor Von Doom what happened. The headmaster decides they shouldn’t be allowed to pass the exam. We find out that the headmaster is none other than Valeria Von Doom. 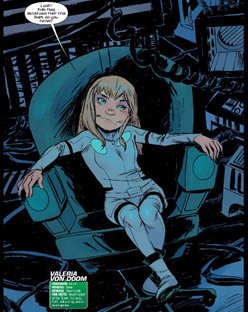 She’s a lot more cartoonishly evil here than she is in Secret Wars, oversized spinning chair included. All that’s missing is a cat for her to stroke as she stares at the computer screen. While a lot happened this issue, I feel like it was more like a really long introduction; a good portion of the comic was dedicated to introducing the main characters after all. I’m looking forward to seeing how the team works together in the exam (or maybe doesn’t work together, I have a sneaking suspicion this isn’t going to go very well.) Also, is Molly even old enough to take the final exam? We’ll just have to wait and see won’t we!